Not a perfect match, but you can clearly see the influence. Let’s see if I can give a more detailed description of what I like about this logo. First, the word ACTION is a gift to any designer: a short, punchy word that begins and ends with great diagonals that help express what the word says. This version throws those diagonals right out to both extreme corners in a way that just says “action” to me. The slant of the word, more severe than italic type, I would guess about 25 degrees, adds to the excitement, giving it motion, as if it’s about to leap to the right, into the story. The letters fit together beautifully giving a staccato of contrasting shapes: A (diagonal), C (half rounded) T and I (vertical, though here diagonal as well), O (fully rounded) and N (here a brilliantly dynamic diagonal like a sideways lightning bolt). The word COMICS provides good contrast, being vertical and more conservative, and the extended horizontal line coming off the A adds an excellent design flourish that helps tie the two words together and make each more readable. The letters are strongly outlined, ideal for a comics logo which has to be easily readable from a distance, with only the S being a little hard to read, which in this case hardly matters. Now that we’ve looked at it from a design standpoint, let’s look at it historically. 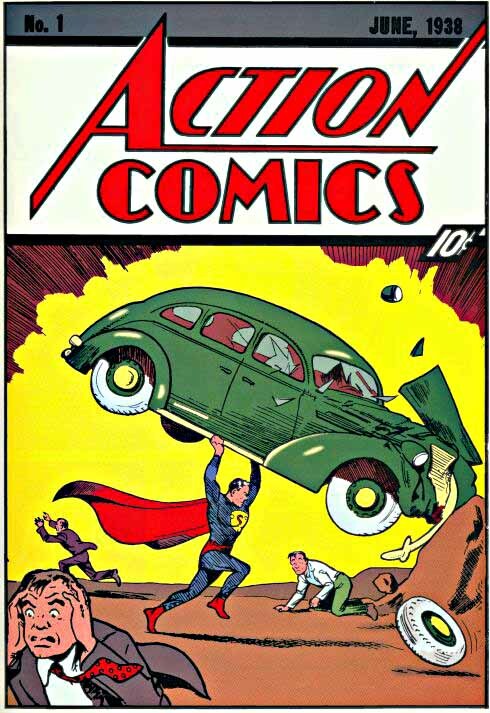 Action Comics was the third title of National Allied Publications, as it was then, debuting in early 1938. 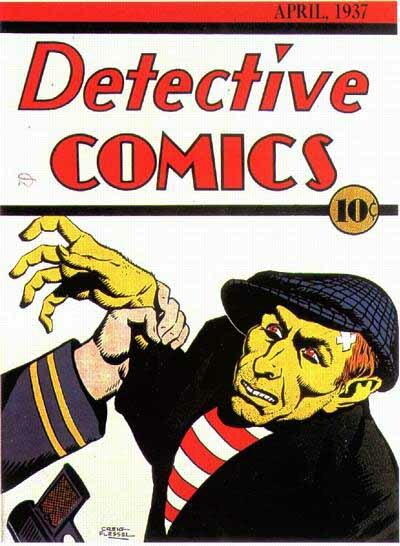 The two previous titles, Detective Comics, and New Fun (becoming Adventure Comics) began the year before. The word COMICS above first appeared, identically, on the second issue of Detective Comics, seen below. Though to my mind not as effective, I would say the word DETECTIVE was designed by the same person who did both COMICS and ACTION. And, though no one can say for sure, the designer was most likely DC logo legend Ira Schnapp. To read more about Ira, I’ll direct you to this excellent, though lengthy, series of articles on DIAL B FOR BLOG. Much of Ira’s history is a matter of speculation, but he certainly is the strongest contender, perhaps the only known one, as the first logo designer for what is now DC Comics, after a few very poor early attempts by others. ADDED: See my latest article on this subject HERE. I now believe Ira Schnapp did not design this logo, and it remains a mystery who did. Here’s another important early document, the ashcan, or publisher’s proposed cover for the first issue, probably made up to show potential distributors and printers what they had in mind, and also to get the name trademarked. 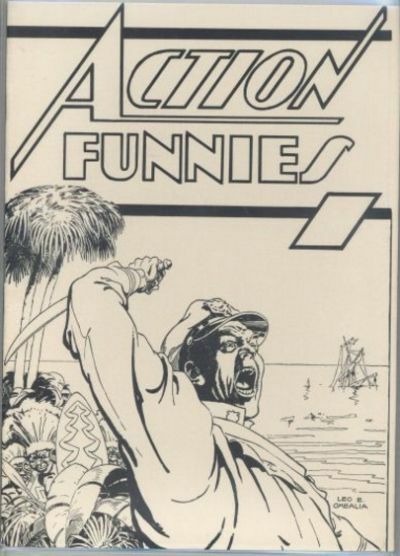 In this version, ACTION is solid, not outlined, like many pulp logos, with COMICS mostly solid, having just small windows for color that suggest three-dimensional facets. This last is a strong pointer to Schnapp, with his classical stone-carving background. 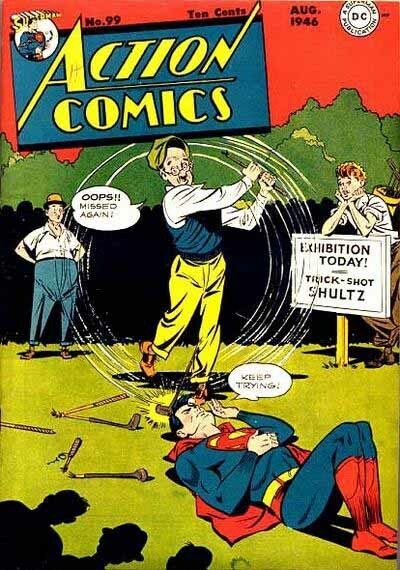 Schnapp had reportedly already been designing show-card lettering for films, and pulp logos, both of which were sometimes solid shapes, and the way the Action Comics logo was presented in the early years, over an open rectangle, it could have been a solid as well, but the outline adds the option of more colors in the logo, which is probably why it was redone that way, to match the Detective Comics and other comics logos of the time. Comics were, after all, full of garish color, the more the better! Looking again at my reference book for pulp covers, “Pulp Culture” by Robinson & Davidson, I see that, while there were some solid pulp logos, the majority of them were also heavily outlined, no doubt for the same reasons. Another ashcan from the same period was assembled with this alternate title. This probably came second, as the logo is now outlined just as on the final cover, and the word FUNNIES matches the final version of COMICS in size and style. The elongated S is an odd variation that I’ve seen in other Art Deco lettering, and I don’t think it works well here, just as well it wasn’t used in the final logo. “Funnies” was another common name for comics at the time, referring to the Sunday Funnies, the color comics supplement that came with most newspapers and spawned the comic book market. If this logo had been chosen, we might all be referring to comics as funnies these days. 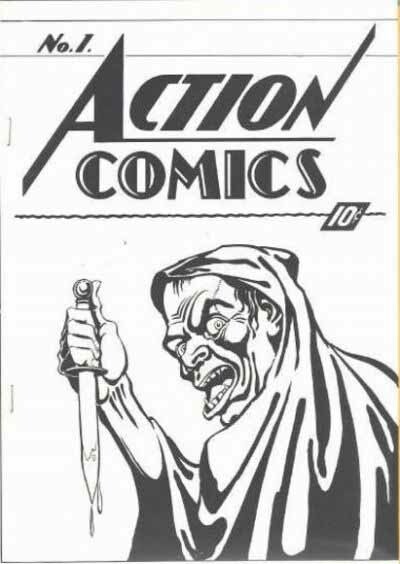 For it’s first 98 issues, the Action Logo remained the same. With issue 99, it was reduced in size and parked with a slight jaunty tilt at the upper left of the cover. I think this reflects the move from the early poster-like pulp images to ones where a scene is depicted that often required word balloons, titles, and other type. The change weakened the impact of the logo, but it left more selling space, which made sense then. Next time I’ll talk about the origins of the Superman logo. This entry was posted in Logo Studies on August 7, 2007 by Todd. The ashcan for Action #1 is AMAZING. What a great grotesque and what a culture-changing decision to put Superman on it instead! Wow. Thank you for this rare look into the process of birthing a legend.